When Irene Forte walked into the launch for her skincare line Irene Forte Skincare at Brasserie Prince, she was the epitome of what you would expect from a founder of a natural skincare brand. Her skin was glowing, she wore almost no makeup, her hair was thick and luscious. She shone from the inside out. Beauty from the inside out is exactly her approach to wellness. Her skincare line represents that by using handpicked active ingredients from Sicily. Below, I caught up with Irene at The Balmoral, Edinburgh who says her skincare ‘is the Mediterranean diet for your skin’. If you want to experience a little bit of Sicily for yourself, I would recommend trying Irene’s ‘secret to super soft, glowing skin’ the MEDITERRANEAN NOURISHING TREATMENT. An hour of bliss with scents transporting you to the Sicilian coast. The perfect treatment for the post winter blues. A double full body scrub to slough away that winter skin, followed by a full body massage with Sicilian oils. Using the finest Mediterranean ingredients, including flowers, fruits, plants, herbs and nuts. Irene Forte Skincare is made by hand and produced in small batches ensuring the highest quality. The range is vegan, clean and free from allergens, parabens, emulsifiers, SLES and SLSs. The packaging is made with 100% recycled fibres, recyclable glass and vegetable and soya-based inks. It is sustainable from production to packaging. There are up to 16 active ingredients in each of the products, all chosen for their powerful benefits on the skin. Some highlights include Verdura’s Organic Olive Oil – rich in Vitamin E and polyphenols to protect the skin against free- radicals and promote cellular renewal. Orange Blossom Oil- – rich in AHAs to exfoliate & hydrate the skin. Rosemary Oil – antibacterial & anti-inflamatory to balance the skin. Grapefruit, pomegranate & papaya – all rich in Vitamin C, a powerful antioxidant. (You can view the full ingredients listing here). Where did your passion for health and wellness come from, is it a family tradition? My father is a fitness fanatic and was always a very successful sportsman. I have always been the same. So my passion for health and wellness started with my love for sport. Was your own skincare line always a goal? Not at all. My passion for skincare is something that has developed – sports and healthy eating came first- spas/ beauty was the natural next step! What makes Sicily so special to you that it inspired your skincare line? I first stepped foot in Sicily in 2003 to visit the site that would soon become The Balmoral’s sister property, Verdura Resort. Six years later, the resort opened its doors and I spent almost a year working there. I fell in love with the people, the culture, the food and breathtaking nature of the island. I realised that Sicily’s rich ingredients and the abundance of Verdura’s organic farm made the perfect starting point for a skincare line. Inspired by Sicily’s authenticity and beautiful nature, I knew that I wanted to create a nutritious and natural skincare line that was sustainable in its entire life cycle. I was also influenced by Sicilian handicrafts, wanting to ensure that my products were handmade and that my treatments focused on the power of touch. Do you have a hero product in the line? It’s hard for me to choose a hero product. Nevertheless, I’d probably say our Hibiscus Night Cream, which is loaded with ultra hydrating, skin softening ingredients such as vitamin E, shea butter, hyaluronic acid and ceramides. Do you have a favourite treatment available at The Balmoral? For the face, I really love the Age-Defying Etna Facial as it uses a selection of hot and cold volcanic stones directly sourced from Mount Etna and includes a double mask application as well as our signature triple facial massage techniques, which guarantee visibly firmer, more radiant results. For the body, our Mediterranean Nourishing treatment is my secret to super soft, glowing skin. This treatment involves a full body double exfoliation with our Apricot Body Scrub, followed by the Trapani Sea Salt Body Scrub, a nourishing massage using Sicilian oils, and is finished with a moisture-locking layer of White Wine Body Cream. Your skincare line is exclusive to Rocco Forte spas – do you have a favourite destination of the spas to visit? I would have to say Verdura Spa at Verdura Resort. You say your skincare line is like ‘A mediterranean diet for the skin’ – what is your favourite mediterranean dish? Not necessarily the healthiest, but I love cacio e pepe ravioli and Fulvio Pierangelini cooks the best version at Hotel de Russiea a Rocco Forte hotel in Rome. What is your most treasured beauty item? My Irene Forte Skincare Hibiscus Night Cream. Do you have a beauty icon? I think Tata Harper has done a pretty incredible job with her brand. You must travel a lot, what three essentials do you always pack? 1. Laura Mercier SPF20 Tinted Moisturiser; I’m not very into make-up, but I cannot travel anywhere without this tinted moisturiser. 3. 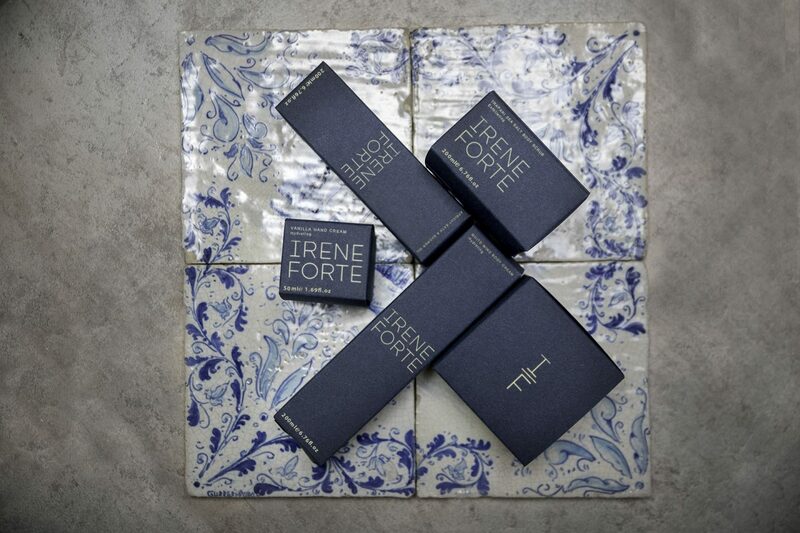 An array of Irene Forte Skincare products. Launched in November 2018, you can find Irene Forte Skincare products and treatments exclusively at Rocco Forte hotels worldwide. Escape to Sicily without leaving the country, book your treatment here.